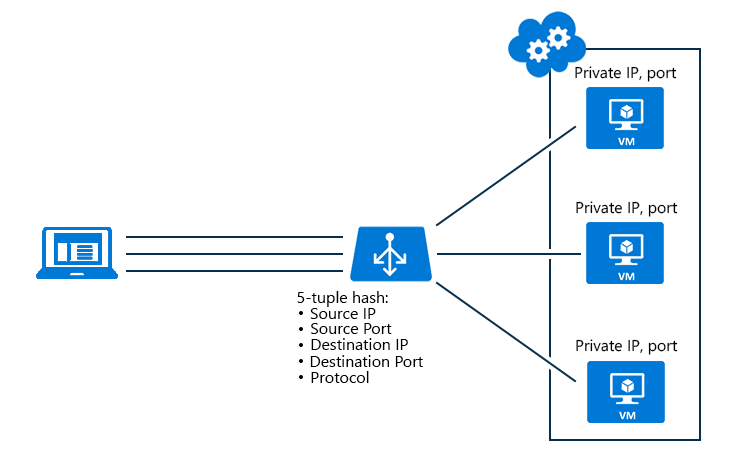 The default distribution mode for Azure Load Balancer is a 5-tuple hash. The tuple is composed of the source IP, source port, destination IP, destination port, and protocol type. The hash is used to map traffic to the available servers and the algorithm provides stickiness only within a transport session. Packets that are in the same session are directed to the same datacenter IP (DIP) instance behind the load-balanced endpoint. When the client starts a new session from the same source IP, the source port changes and causes the traffic to go to a different DIP endpoint. Load Balancer can also be configured by using the source IP affinity distribution mode. This distribution mode is also known as session affinity or client IP affinity. The mode uses a 2-tuple (source IP and destination IP) or 3-tuple (source IP, destination IP, and protocol type) hash to map traffic to the available servers. By using source IP affinity, connections that are initiated from the same client computer go to the same DIP endpoint. The following figure illustrates a 2-tuple configuration. Notice how the 2-tuple runs through the load balancer to virtual machine 1 (VM1). VM1 is then backed up by VM2 and VM3. Source IP affinity mode solves an incompatibility between Azure Load Balancer and Remote Desktop Gateway (RD Gateway). By using this mode, you can build an RD Gateway farm in a single cloud service. A client initiates a TCP session to the load-balanced public address and is directed to a specific DIP. The channel is left active to monitor the connection health. A new UDP session from the same client computer is initiated to the same load-balanced public endpoint. The connection is directed to the same DIP endpoint as the previous TCP connection. The media upload can be executed at high throughput while maintaining a control channel through TCP. When a load-balanced set changes by removing or adding a virtual machine, the distribution of client requests is recomputed. You can't depend on new connections from existing clients to end up at the same server. Additionally, using source IP affinity distribution mode can cause an unequal distribution of traffic. Clients that run behind proxies might be seen as one unique client application. Set the value of the LoadBalancerDistribution element for the desired amount of load balancing. Specify sourceIP for 2-tuple (source IP and destination IP) load balancing. Specify sourceIPProtocol for 3-tuple (source IP, destination IP, and protocol type) load balancing. Specify none for the default behavior of 5-tuple load balancing. 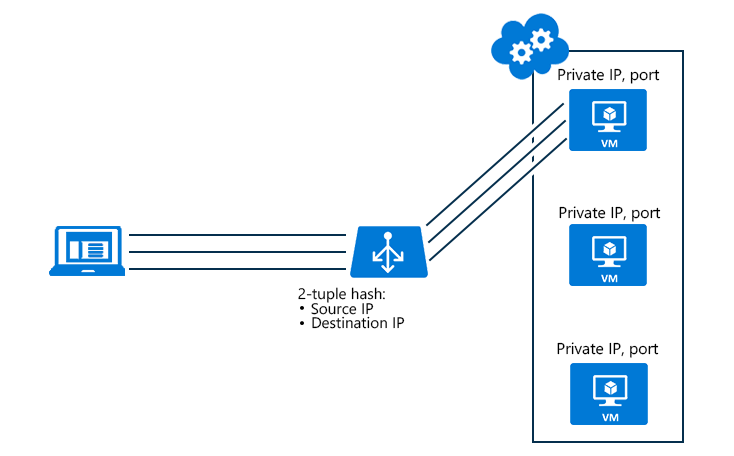 When the LoadBalancerDistribution element is not present, Azure Load Balancer uses the default 5-tuple algorithm. Use the Azure SDK for .NET 2.5 to update your cloud service. The endpoint settings for Cloud Services are made in the .csdef file. To update the load balancer distribution mode for a Cloud Services deployment, a deployment upgrade is required. The following example shows how to reconfigure the load balancer distribution mode for a specified load-balanced set in a deployment. Use the Azure classic deployment model to change an existing deployment configuration. Add the x-ms-version header and set the value to version 2014-09-01 or later. As previously described, set the LoadBalancerDistribution element to sourceIP for 2-tuple affinity, sourceIPProtocol for 3-tuple affinity, or none for no affinity (5-tuple affinity).